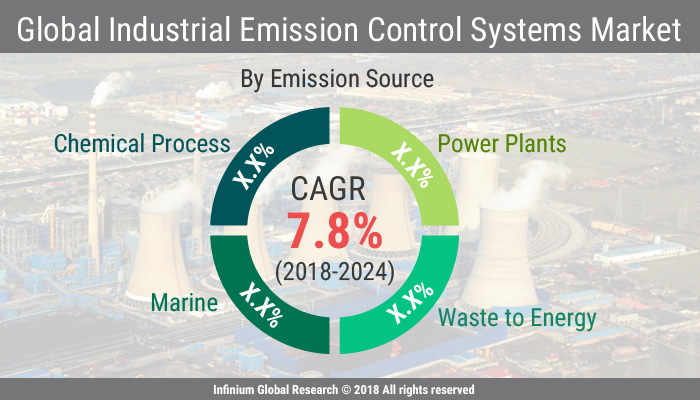 A recent report published by Infinium Global Research on industrial emission control systems market provides in depth analysis of segments and sub-segments in global as well as regional industrial emission control systems market. The study also highlights the impact of drivers, restraints and macro indicators on the global and regional industrial emission control systems market over the short term as well as long term. The report is a comprehensive presentation of trends, forecast and dollar values of global industrial emission control systems market. According to report the global industrial emission control systems market is projected to grow at a CAGR of 7.8% over the forecast period of 2018-2024. Industrial air pollutants are responsible for a number of adverse environmental effects, such as photochemical smog, acid rain, death of forests. The major sources of greenhouse emissions are transportation, electricity production, land use, forestry, and agriculture. Emissions of greenhouse gases from combustion of fossil fuels are associated with the global warming of Earth's climate. Hence, the Industrial emission control systems are used that monitors and reduce harmful products that are released by combustion and other emission processes that cause environmental pollution. Increasing demand for electricity with growing infrastructure are anticipated to drive the global industrial emission control system market. Additionally, positive outlook towards chemical, automobile and refineries are expected to fuel the growth of the industrial emission control systems market .Moreover increasing construction spending is further expected to compliment industrial growth. On the other hand, growth of the coal power industry in developed nations will also help to drive the growth of the industrial emission control systems market. However, growing use of alternative fuels for power generation in a proposal to reduce the dependency of coal is anticipated to hinder the growth of the industrial emission control system market over the forecast period. On the other hand, industries emits harmful toxic gases that includes the materials such as NOx, Sox, VOCs which are extremely harmful for the environment and high proportion of this pollutants leads to serious health concerns. Furthermore, government across the globe are striving to reduce environmental damages by developing policy framework that is anticipated to motivate the implementation of various pollution control technologies. This in turn is expected to provide several growth opportunities for the key players in the industrial emission control system market over the upcoming years. Moreover, traditionally power plants have installed the devices that have the life around 10 to 15 years and hence power generation industry has become the major industry owing to the replacement of the older devices. This is anticipated to be the severe factor for the growth of the industrial emission control system market over the years to come. Among the geographies, Asia pacific region is the major contributor in terms of revenue followed by North America. Additionally, globalization has led to various manufacturing companies from the developing countries such as India and china to migrate to the low cost countries. Moreover, government initiatives in infrastructure and urban development are anticipated to drive the cement industry in the Asia Pacific regions. On the other hand, the development of coal-fired power plants has particularly gained momentum in the Asia Pacific regions owing to the shortage of developed renewable energy infrastructure. Countries such as Indonesia and Thailand besides China and India could enlarge the demand in Asia Pacific with their rising need for electricity. The prominent players in the industrial emission control system are Johnson Matthey, BASF, Babcock & Wilcox Enterprises, Amec Foster Wheeler, and Mitsubishi Hitachi Power Systems. In addition, presence of large number of international players in US have created awareness regarding system up gradation and installation of technologies to limit the pollution. The report on global industrial emission control systems market covers segments such as, emission source and device type. On the basis of emission source the global industrial emission control systems market is categorized into power plants, chemical process, marine and waste to energy. On the basis of device type the global industrial emission control systems market is categorized into esp, catalytic reactors, incinerators and filters. The report provides profiles of the companies in the global industrial emission control systems market such as, Mitsubishi Hitachi Power Systems, Johnson Matthey, BASF, Amec Foster Wheeler, Ducon Technologies, General Electric Company, Thermax, Wilcox Enterprises, Air Clean LLC and APC Technologies. The report provides deep insights on demand forecasts, market trends and micro and macro indicators. In addition, this report provides insights on the factors that are driving and restraining the global industrial emission control systems market. Moreover, IGR-Growth Matrix analysis given in the report brings an insight on the investment areas that existing or new market players can consider. The report provides insights into the market using analytical tools such as Porter's five forces analysis and DRO analysis of industrial emission control systems market. Moreover, the study highlights current market trends and provides forecast from 2018-2024. We also have highlighted future trends in the industrial emission control systems market that will impact the demand during the forecast period. Moreover, the competitive analysis given in each regional market brings an insight on the market share of the leading players. This report will help manufacturers, suppliers and distributors of the industrial emission control systems market to understand the present and future trends in this market and formulate their strategies accordingly.